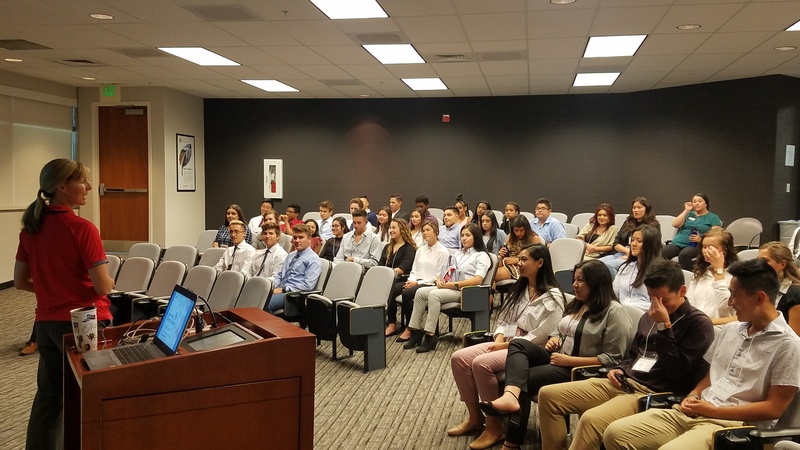 A group of about 60 students in the University of Colorado Summer Bridge program visited Key Equipment Finance’s offices this month to learn about career options in banking and finance. KeyBank is creating a more sustainable economy through products and services that support green buildings, energy efficiency, high efficiency vehicles, and renewable energy. In addition, Key’s Energy Efficiency and Renewables team helps businesses of all kinds achieve sustainability – whether directly to businesses through energy upgrades that improve efficiency, reduce waste, and minimize the impact on the environment, or as a financing partner to renewable energy providers and their clients. Key Equipment Finance employees gave their time and energy Wednesday to help nine local community organizations with various tasks ranging from painting and yard work to making blankets for children. As commencement speaker last week to the 2018 graduating class from the Leeds School of Business at the University of Colorado Boulder, KeyCorp Chairman and CEO Beth Mooney started her address by explaining to graduates the importance of focusing as much on the "how" as the "what" needed to achieve a successful career. The holidays may seem long past now, but thank yous that read "this means more than you'll ever know" and "this is a blessing and helped us out a lot" still echo for Key Equipment Finance and KeyBank employees who volunteered their time and resources during the holidays for the Denver Santa Claus Shop (DSCS). One in seven Coloradans struggle with hunger, and one in six of those individuals are children, something organizations like Food for Thought are trying to improve with the help of supporting partners such as Key Equipment Finance. About 70 MBA students from the University of Colorado Boulder last month headed eight miles down the road to Key Equipment Finance's offices in Superior to hear Adam Warner, president, and Deborah Brady, chief financial officer, share their insights on the $1 trillion equipment finance industry. Key Equipment finance senior managers and employees raised $1,701 in donations at a recent "Celebrity Happy Hour" fundraiser in support of the United Way.